If you are an iPad owner and a passionate retro gaming fan, here is a late Christmas gift that you might want to consider treating yourself to. The iCade is currently on sale at Bed, Bath and Beyond (yes, that Bed, Bath and Beyond) and can be owned for a reasonable $50. That is half as much as it was priced at when it was launched in the U.S. earlier this year by the guys at ThinkGeek. In case you have never heard of the iCade before, it is arguably one of the most awesome-looking gaming accessories that have ever been tailored for use with the iPad. 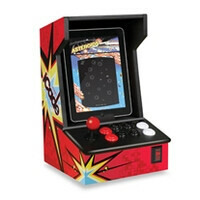 Designed to work with both the iPad and the iPad 2, the iCade lets you to play a number of classic video games in style as it is shaped like an old-school arcade game cabinet. Besides, it features arcade-style joystick and 8 action buttons for that authentic classic feel. Connecting to the iPad is done over Bluetooth, which is why the accessory requires a pair of AA batteries. Currently, the iCade is compatible with more than 100 Atari classics, such as Asteroids, Centipede, Battlezone, and Tempest. On top of that, there are over 30 titles in the App Store that can be played by using the accessory. And if your iPad has been given the jailbreak treatment, you are free to use the iCade with your favorite MAME emulator. The iCade appears to be out of stock online at this time, but perhaps you might manage to find one in your local Bed, Bath & Beyond store. Of course, don't hesitate to let us know if you get one by dropping a comment below. these have been out for months? since the summer i can recall?